. Onipedia - 鬼ペディア　- Oni Demons - ABC-List - . 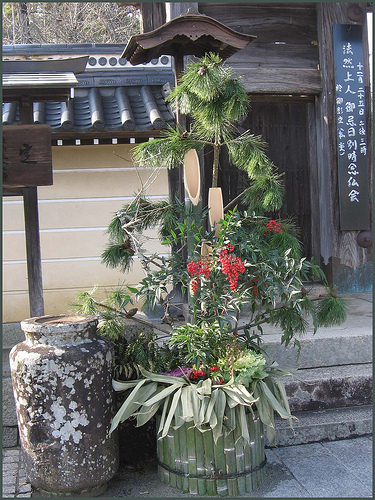 Kadomatsu are placed in front of houses, temples, shrines and official buildings to welcome the New Year deity, purify the entrance and drive demons and evil spirits out.
. kadomatsu 門松 pines (decorations) at the gate . pine and bamboo 松 竹は「鬼の木」 are trees which the Oni dislike most. is an old Japanese proverb. Pine and bamboo are popular materials for kadomatsu because people wish that Yorishiro, the place in which the deity lives, will last forever. On the island 薩南大島 Satsunan Oshima people put out Kadomatsu for the New Year. an Oni had come down from the sky to haunt the island, but the villagers caught him and bound him to a pine tree. The strong Oni pulled out the tree and run away. They caught him again and bound him again to a pine tree, this time so strong that he could not run away. Since that time the Oni are afraid of pine trees. they put up a Kadomatsu with bamboo in the middle, so that the Oni hurt his stomach when climbing on it, and the Oni died. 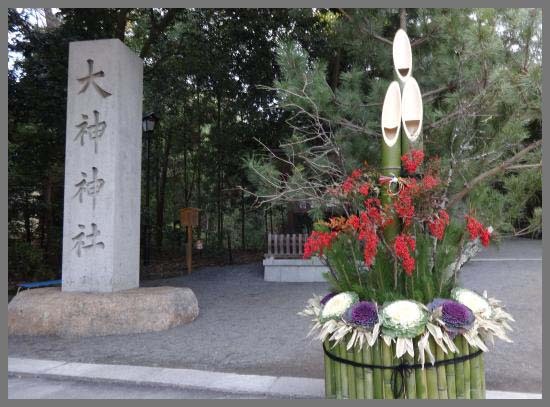 Since then people put up Kadomatsu with bamboo. On the island 加計呂麻島 Kakeroma they put out Kadomatsu with bamboo. The villagers know that once an Oni hurt his stomach when climbing on it, and the Oni died. Once upon a time, the villagers had tied a rabbit to the Kadomatsu pine tree. The oni came and pulled the tree out with its roots. The villagers followed the imprints of the roots on the ground and could eventually get the rabbit back. Since then the Oni are afraid when they see a pine tree and do not come close to a home with such a decoration. Once a villager got up early in the morning on the first day of the New Year. He saw three strange black clouds in the sky. This was the figure of an Oni who had turned up to heaven in great fear when seeing the Kadomatsu in front of a home. 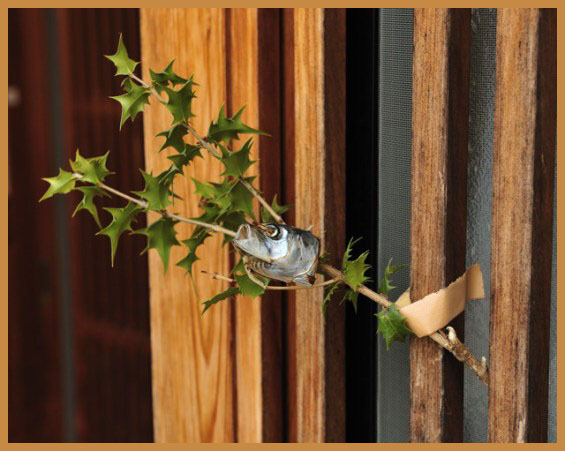 For the Setsubun ritual (the former New Year ritual), people used to put out a holly branch with the head of a sardine to ward off the Oni. 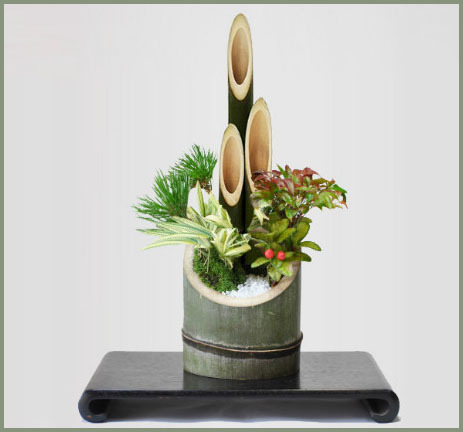 When making a Kadomatsu, they used two strong stakes, a bamboo basket with many "eyes", a black pot hanger and a branch of hiiragi 柊 holly. The beans for throwing had to be roasted very well.
. hiiragi iwashi 柊鰯 Holly and Sardine Head . If people walk through the pines of the Kadomatsu decoration, they will become Oni. So many homes put only one decoration out.
. - - - Join the Onipedia friends on facebook ! - - - .
. Mingei 民芸　Regional Folk Art from Japan .